After experimenting and testing of various beta versions, now the official final and full OS X El Capitan 10.11.3 (Build: 15D21) Update for Mac devices has been released by Apple with some minor and major features and functionalities changes, fixes and improvements, particularly for security, stability, performance, compatibility and bugs. Safari 9.0.3 web browser is also available for latest and old operating systems. Mac general public users can Download OS X 10.11.3 Installer .DMG Setup and Delta / Combo Update Files via Direct Links for free. 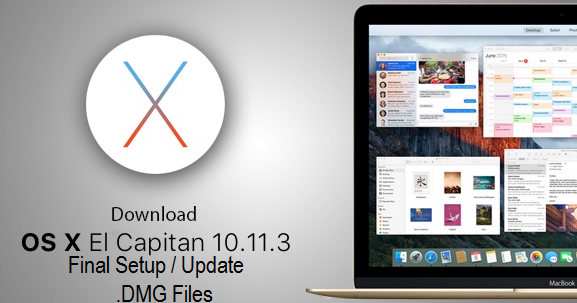 How to Manually Install OS X El Capitan 10.11.3? For instant free OS X 10.11.3 Update from Apple, just head-over to App Store >> Software Update option. For manual installation of OS X 10.11.3 with Bootable USB or DVD on multiple computers / laptops, Mac users can get the official Direct Download Links of OS X 10.11.3 Final Installer .DMG Setup and Delta / Combo Update Files available below.